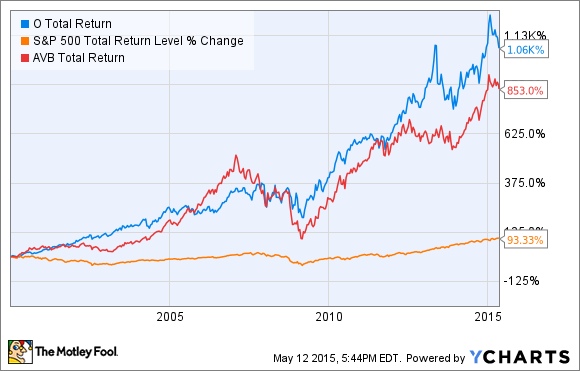 Not all REITs are equal. Here are three that stand out above their peers. It's difficult to say which REITs are the "best of breed" -- after all, REITs invest in many different types of real estate, and the best approach to investing in REITs is to diversify. My favorite REIT specializing in commercial properties, and one of my favorite overall stocks in the market, is Realty Income Corporation (NYSE:O). The company's fantastic business model has produced consistent market-beating returns while giving shareholders a growing monthly dividend. The idea is simple. Realty Income acquires freestanding retail properties all over the United States, which it leases to high-quality tenants, most of whom represent national brands such as Walgreen, FedEx, and Dollar General. And while it's true that retail real estate can be sensitive to recessions, Realty Income's strong and diverse group of tenants has kept occupancy high -- currently at 98.4% and never below 96%, even during the financial crisis. Further contributing to the stability is that all of Realty Income's tenants are on long-term "net" leases, which have annual rent increases built in and hold the tenants responsible for variable expenses such as taxes, insurance, and maintenance. All Realty Income has to do is collect a rent check. Finally, Realty Income has suffered a pullback lately: It's down more than 12% since February, making this an appealing buying opportunity. There are several high-quality residential REITs that specialize in single-family housing, apartments, or student housing, but my personal favorite is AvalonBay (NYSE: AVB). The primary reason I like AvalonBay is its emphasis the emphasis on value creation through development, as opposed to simply acquiring properties. During 2014, AvalonBay completed $1.1 billion in new development during 2014, and the newly constructed apartments generate average rental rates that are 7% higher than AvalonBay's existing portfolio. And surprisingly, these were completed at a cost of roughly $275,000 per rentable unit – 25% less than the average market value of AvalonBay's existing portfolio. Since AvalonBay's existing portfolio of properties has an average age of 19 years, the company is happy to dispose of some of its older properties at relatively higher market values, and then use the proceeds to fund the development of new units that will cost less and generate even more rent. And, with its strong financial position, AvalonBay also has the ability to fund development with readily available low-cost capital, and its most recent debt offering was issued at a 3.5% interest rate. In addition, AvalonBay has another 4,000 rentable units under construction, so this cycle of value creation should continue for years to come. And, bear in mind that this is in addition to natural gains in property values over time. The strategy seems to be working: The company has produced a strong 16.2% average total return over the past two decades, and the continued ambitious growth gives no indication that this performance won't continue. AvalonBay's closest competitor is Equity Residential (NYSE: EQR), which has a similar business model: developing and managing properties in markets with high barriers to entry. Equity owns slightly more properties (392) and focuses on many of the same "core" markets, and it's a perfectly good REIT. However, Avalon is my personal preference since it has a more aggressive approach to the development strategy I mentioned above. I noted earlier that AvalonBay completed roughly $1.1 million in new communities in 2014 alone, while Equity completed $883 million in new properties in the past four years. No investment that has the potential to produce double-digit returns is without risk, and REITs are no exception. Rising interest rates can affect property REITs -- most REITs finance some of their properties, so rising rates can increase the cost of borrowing and eat into profit margins, and when rates rise, "safer" investments such as bonds begin to look more appealing to investors, which can create selling pressure on REITs. And bear in mind that since most REITs invest in a single property type, they are vulnerable to weakness in that particular type of property. For example, if one of Realty Income's largest tenants were to go bankrupt, it could severely affect the company's earnings and have a ripple effect across retail property values.